WA Olympian Sonja Johnson capitalised on a “training” run to win the headline CNC3* class at BGC Quarries Wooroloo 1 (12-13 May) with Misty Isle Valentino. “We’ve only just returned from Sydney three-day but we had a few time penalties there as he was quite argumentative,” said Sonja, who is based on the family farm near Albany. Sonja was full of praise for Wayne Copping’s undulating cross country track: “There were some really good questions and lots of turning combinations which pleased me as that's just what I wanted to test with the new bit.” An exceptionally warm and dry autumn meant that organisers were forced to water the show jumping ring and Sonja also commended their “amazing” efforts, noting that the cross-country ground felt “wonderful” in the sections that had been aerated. 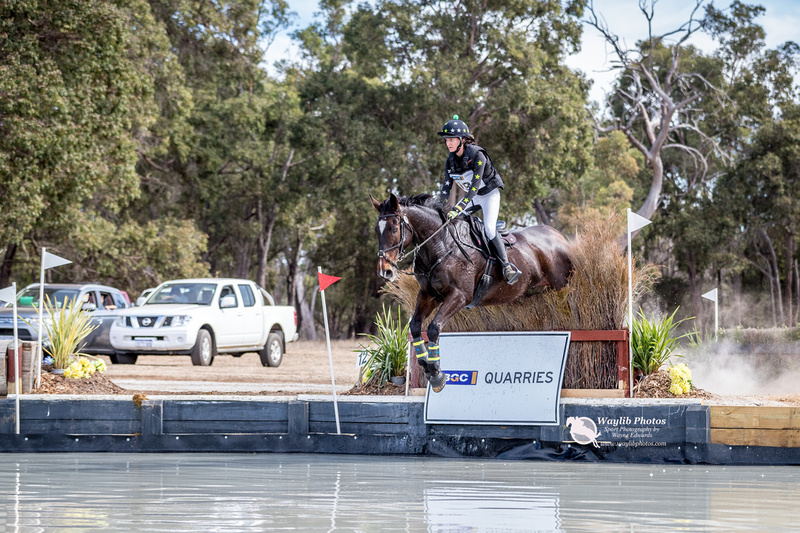 Riders also enjoyed their first splash in Wooroloo’s new $10,000 cross country water complex that was completed thanks to generous sponsorship of materials by BGC Quarries. Sonja was pushed all the way in the three-star by Belinda Isbister and the classy off the track Thoroughbred, Here to Stay, who were so unlucky to knock out the final two elements of the tricky triple combination, the last fence in Ed Murphy’s influential show jumping track, which was cleverly positioned directly in front of the gathered crowd. Cindy Lyall topped the BGC Quarries CNC2* class. Her off-the-track Thoroughbred GI Joe is so scopey he appears to hang in the air over the fences. That cost her nine jumping time penalties, but she still edged out Emily Gray (Rio Tonto) by more than four penalties. “He was really over jumping so it’s something we will go away and work on. Cross-country is his strength and he was the fastest horse out there,” explained a delighted Cindy. Cindy’s 15YO son, Zane, was also celebrating as part of the winning team in the inaugural Wooroloo Teams Challenge, sponsored by Winteringham Recruitment. Bates Saddles CNC1* winner Jess Keeble Jenkins was thankful for the balmy autumn conditions in the Perth Hills, where temperatures reached the mid-30s over the weekend. “Hard Target (‘Alvin') can be tense in the dressage but we were lucky it was warm,” said Jess, who rose from seventh place after dressage thanks to the only clear inside the time across country. “He’s a cross-country machine with a heart of gold - this is one of my favourite events because it’s always a challenging cross-country course and you can’t afford to go out there feeling too relaxed.” The 20YO from Wanneroo puts huge value on the welfare of her horses and has recently completed an equine Bowen therapy course. “They give me everything so I think I should repay them by making them feel as comfortable as possible,” said the Edith Cowan University paramedical sciences student. One of the youngest winners of the weekend was 13YO Olivia Ruiz and the smart TB x Riding Pony, Holland Park Riviera. The stylish pair caught the eye en route to victory in the Dark Selections EvA80J on their first visit to the Wooroloo Prison Farm. “I’m really chuffed to win here as it was new surroundings for both of us. ‘River' can be cheeky but he’s also talented,” said the Perth College student who was also keen to thank her coach, Philippa Collier, and her supportive parents. Many competitors at Wooroloo were also thankful for Olivia’s mum, Angela, who spent the whole weekend keeping everyone well fed working as a volunteer in the Perth Horse Trials canteen. The next event at Wooroloo Prison Farm will be Wooroloo International Three Day Event (17-20 August 2018).